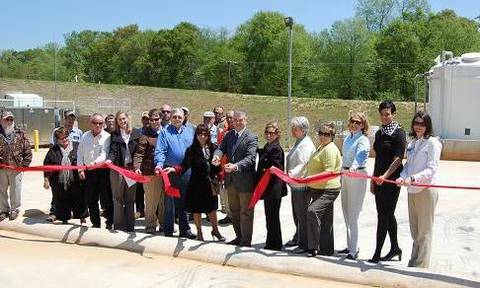 The Town of Williamston and United States Department of Agriculture (USDA) Rural Development held a ribbon cutting ceremony Monday to celebrate the completion of the town’s Waste Water Treatment Plant (WWTP) facility upgrade. The ribbon cutting was held on Earth Day, April 22, and included various officials from the town, county and Rural Development. USDA/Rural Development representatives attending included Michele Cardwell, Acting Community Facilities Program Director, Susana Villescas, Acting Area Director Area 1, Lara Ashy, Area Specialist, Debra Green, Area Specialist, Pearl Acuff, Area Specialist and Elonzo Kitchings, Acting Public Information Coordinator. 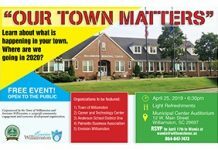 Also attending were Anderson County Council District Seven Representative Cindy Wilson, Williamston Councilman Otis Scott, Williamton Councilman Rockey Burgess, Mary Catherine Price of Goodwyn Mills and Cawood and Bryan Royal of contractor Harper Corporation, and water and street department employees. 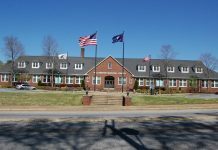 Conspiciously absent were former Mayor Carthel Crout and former Town Administrator Phyllis Lollis who oversaw the $5 million project during the three years of construction. Also absent was former Public Works Director Tim Hood who was heavily involved in the project. David Rogers, who is now heading the public works department, was in the hospital due to a virus he has been dealing with. According to USDA Rural Development Area Specialist Debi Green, the two phase project included numerous upgrades at the WWTP including new computer software, pumps, flow meters, changes in chemical treatment, pond modifications and sludge removal. It also included replacing an aging sewer line. The upgrade was initially managed by Goldie and Associates but was finished under the direction of Goodwyn Mills and Cawood who are now managing the facility. Phase 1 was approved for grant/loan funding of $4,869,600 by USDA Rural Development in June of 2009, Green said. The funding included a $2,743,000 loan and a $2,126,600 grant. The completed WWTP facility includes an equalizer pond, anoxic treatment pond, second areator treatment pond and two clarifier ponds, all of which contribute to better treatment and meeting DHEC discharge standards officials said. The treatment basins have liners which should have no maintenance for 30 years. A 300,000 gallon above ground sludge digester tank was also added. The project also included replacing a sewer line known as The Milliken line, which had about half of the town’s sewer flow going through it. The project also included removing sludge from all four of the facilitie’s old lagoons. Phase 1B, approved in January of 2010, included a USDA Rural Development loan of $1,080,200 and a grant of $824,800. It included a holding pond, pumping and filtration equipment and upgrades to the computer system. A new concrete and paved entryway was constructed for the facility. Due to the project coming in under budget, the town was able to use remaining funds to purchase additional equipment including a tractor/mower, a shed to house the tractor, two new trucks, lawnmowers and trimmers and safety related equipment including an eye wash station. Green said the remaining funds were used for the purchases which she said are within the scope of work under the loan/grant. As Administrator, Phyllis Lollis was able to put together an early closing on the loan for the WWTP upgrade, which saved the town $12,400 a year. The savings will amount to $496,000 over the life of the loan. Also during the construction period, Lollis was instrumental in discovering discrepancies in invoicing which amounted to $87,000 in savings for the town. In a phone interview Tuesday, Lollis said she was very proud of the project, which was one of the largest the town has undergone in years. The town’s old water treatment plant was paid off in 2012 and beginning in December, $12,500 of the $25,000 payment began going toward the payment for the WWTP upgrade loan/grant. The monthly payments for Phase 1 and 1B of the WWTP upgrade are $9820 and $3660. The loan will be paid back over a period of 40 years. Interest rates on the two loans are 2.49 percent on the larger amount and 3 percent on the other.